I am never at ease in conversations on African fabric with people from the aid world and with scholars of cultural disciplines related to African arts and crafts. As a matter of fact, I think that sometimes historians, sociologists, development experts that usually write on this matter tend to focus on African fabric only in relation to the past. I have read a lot of beautiful essays on the role of fabric in traditional cultures and in shaping identities all over the continent (with a particular focus on West Africa, of course). They are beautiful and enriching, as all analyses based on a historical perspective can be. But some of them convey the image of something crystallized in shapes and practices that don’t evolve. My work (at the Ethical Fashion Initiative http://ethicalfashioninitiative.org) takes me towards another direction: what to do with African textile traditions, in the world of today, when it comes to trade and to using them as a vehicle of income generation for people who live at the margins of their societies. From this point of view, fabric and weaving traditions are a starting point: if knowing the roots of these traditions – or rather culture – is important to whoever works in this area, the main issue is how to allow the value chain of textile to become part of a wider vision, capable of supporting a process of change and empowerment for people. I would like to develop my take on this vision from three different perspectives that demonstrate how weaving and textile heritage can be both an obstacle and a tool for development, depending on how we look at them. They are about: gender, market and creativity. 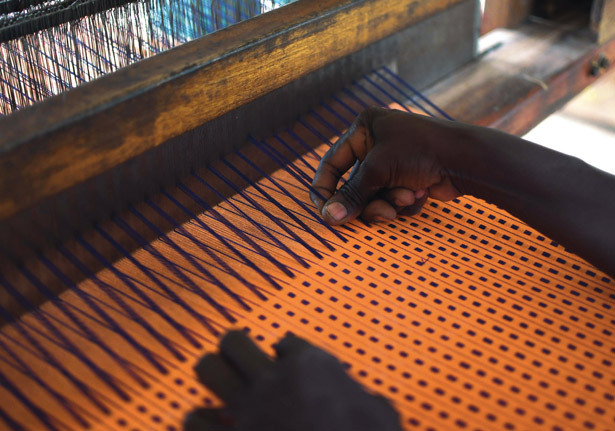 We can consider weaving as one of the endowments of African societies and, as such, a factor that also reproduces social structures and hierarchies. Weaving is often a tradition linked only to men. Women, because of the physical posture of the body in old weaving systems, could not access it. But this is something that is not cast in bronze. In Burkina Faso, the administration of Thomas Sankara, focused on social development and gender equality and introduced new weaving tools (the vertical loom) that “liberated” women, by allowing them to weave and to have a stake in an income generating activity previously reserved only to men. It happened in the 80’s: a traditional tool of male dominance was changed into a vehicle of female empowerment. This was due to vision (Sankara had a lot of it) and a way of approaching cultural endowments from a perspective of social change. Sankara didn’t simply preserve a tradition: he allowed it to flourish in a new way. 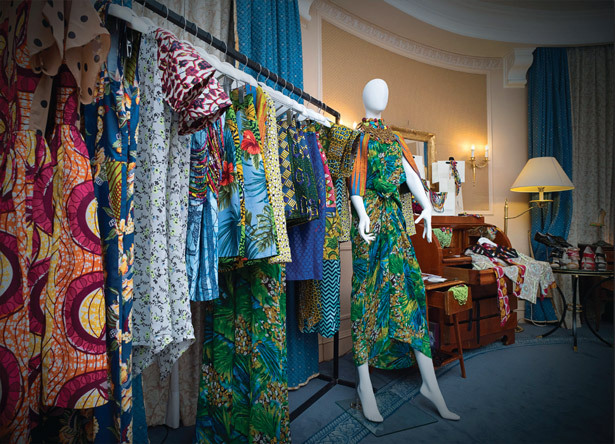 As a commercial product, African fabric is beautiful and has always been used in fashion collections (since the days of Yves Saint Laurent, and do we want to remember the collections of Romeo Gigli, in the 80’s?). But the question is: why do we still see the same patterns and styles repeated for decades? Answer: no product development. Keeping something linked to tradition equals keeping it into a separate ghetto, to be admired, cherished, studied, but not allowed to change and thus to grow. If Italy (to make an example of a country with weaving traditions) had not distanced itself from tradition, by innovating in product design and in processing technology, we would not have the Italian fashion industry today. Yes, the roots of Renaissance and of classic weaving are still visible in Italian fabrics, but they belong to the past; they have been used as a foundation for something bigger and different. I always think of Emilio Pucci: his colour innovation was rooted in an ancient history (his family was already powerful at the time of the Medici), but he distanced himself from it, by launching patterns and color compositions that were contemporary and appealed to a whole world of sophisticated consumers. In Florence, his birth place, there is a foundation that preserves a precious skill in silk weaving (Fondazione Lisio). This is something unique and beautiful, but it did not stop the local textile industry from evolving. When it comes to Africa, this does not apply. Historians and development experts seem to be stuck in the past and cannot conceive anything but ethnic (traditional) fabric: a recipe for disaster, commercially speaking. The classification of African textiles as ethnic is a textbook error on how too much focus on tradition can prevent development and innovation. at a street theatre festival: Les Récréâtrales (http://www.recreatrales.org/en). I have rarely witnessed such cultural richness: a whole quarter of Ouagadougou was closed totraffic and transformed into a place for art installations and theatrical plays (that were staged in the courtyards of private houses along the main road.) Directors, actors, artists from the region and beyond were all there. This is just an example: just check the movie festivals in the region, not to mention the new galleries of contemporary art that are popping up everywhere. Western Africa is rich in creativity, which can be applied to weaving skills and traditions. At Les Récréâtrales, the handwoven fabrics of the Ethical Fashion Initiative were used to decorate the whole setting and to produce installations. Perhaps not by chance, Aboubakar Fofana, the greatest of all Western African indigo dyeing masters, was invited by Documenta14 (http://www.documenta14.de/en/) (the main appointment for contemporary art lovers) to create two installations in Kassel and Athens. Fofana works with fabric and indigo and has long collaborated with top fashion brands. His looks are contemporary and sleek: he has revitalised a tradition, by looking at the world of today. At the Ethical Fashion Initiative we support this approach and we have enabled many communities of weavers to be part of an international supply chain: contemporary Bogolan from Mali and Danfani from Burkina Faso, with new colors and patterns, have become part of fashion collections that are sold world-wide. We also have the case of a customer (a large Japanese distributor and brand: United Arrows) that has created a specific brand (TÉGÊ) using fabric produced in West Africa through the Ethical Fashion Initiative to make beautifully tailored suits for men. Together, the three points above convey a message: a call to refrain referring to African fabric simply as an ethnic product. It has a beautiful heritage that is evolving towards becoming a fashion supplier for the world of today. Keep going to Africa to buy handicrafts, keep on studying heritage. But let fashion and creativity unfold their socio-economic potential for African weavers and artists. A key step forward is to integrate market and product knowledge into development and business opportunities on the continent. Simone Cipriani is the founder and director of the Ethical Fashion Initiative (EFI).